I have to thank Sean Williams for alerting me to this video about the astonishingly beautiful work of Dutch sculptor, Theo Jansen. 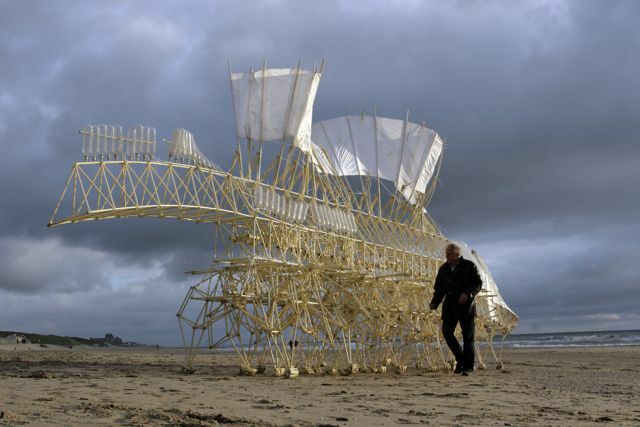 Called Strandbeest (Stranbeests? Strandbeesten?) they are crafted from plastic piping and walk and move using systems of sails to harness the wind. Even on video they’re extraordinary things: marvellously intricate, improbable, strangely weightless, but what really fascinates me about them is the quality Jansen himself is alert to, which is the way their motion and delicate skeletal structures seem to elide the boundary between the biological and the mechanical. Nor is this just a matter of appearance: Jansen designs them using a computer program that utilises genetic algorithms to improve their design and selectively “breeds” them to improve their performance. Little wonder that as they shimmer along the beach it’s so easy to believe you’re seeing some form of alien life possessed of its own presence and purpose. This quality is also present in many of the creations of roboticists at places like M.I.T. (or this robotic pack mule designed for use in Afghanistan and other mountainous areas (and indeed drones like the ones featured in the final moments of the same video)), and, in rather different form in the work of artists such as Patricia Piccinini (whose bizarre Skywhale has been hovering over Canberra for the past week or so) and Miyo Ando’s beautiful work with bioluminescence, all of which seek to grapple with the way the once clear divisions between life and non-life, biological and artificial are breaking down (interestingly Jansen’s creatures are created from plastic tubing, itself, and artificial substance made from organic compounds). These are questions I’ve been thinking about a lot lately, partly because the novel I’m working on is set across the next century, and is very much concerned with many of these questions and the intersecting notion of the Anthropocene (as was my Aurealis Award-shortlisted story, ‘Visitors’), partly because I’m hoping to write something rather longer on the subject later in the year. But in the meantime you should take the time to watch the videos below, and to visit Jansen’s website, which has more information about him and the project. I’m grateful to L. Lee Lowe for alerting me to this TED video of Jansen talking about his creations. Whoops, again I’ve forgotten that the Amazon link shows up so overwhelming in-yer-face. Apologies!